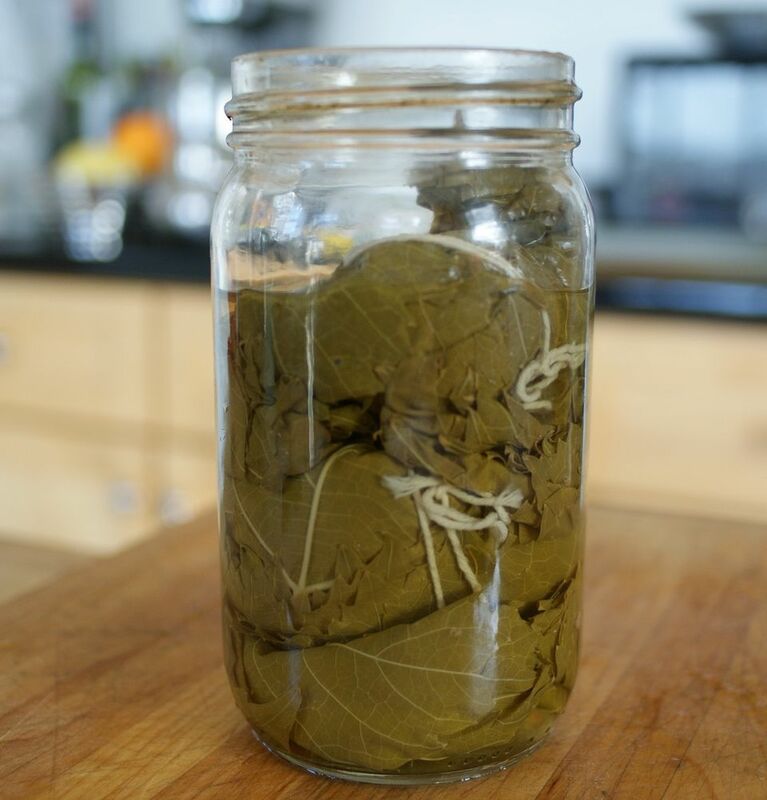 Preserved Grape Leaves are shockingly easy to make. The trickiest part will be finding the grape leaves if you don't have any vines at your place. Why would you want to preserve grape leaves? Why, to make stuffed grape leaves later in the year, of course! You can also use grape leaves to wrap fish in to protect it from the heat of the grill (and keep the fish from sticking), as well as stuff the leaves with feta and baked them before serving with crackers to scoop up with melted cheese. Note: It doesn't happen often, but as with Canned Tomatoes, this is an instance where you can use bottled lemon juice for its consistent acid levels, which are key to the home canning of low-acid foods like this one without a pressure canner. Again, to be clear, do not just fresh lemon juice in this recipe, use the bottled kind. Note #2: This recipe makes 1 pint but can be increased as your grape leaf supply demands. Bring a pot of water to a boil and add enough salt to make it taste like the sea. Also bring a canning kettle or other large pot of water to a boil. Dip the grape leaves in the boiling salt water until they wilt, about 30 seconds, then quickly pull them out and drop them into the ice water to cool. Drain them once all the leaves are fully cool. If you're dealing with a lot of leaves, you may need to freshen the ice water a long the way to keep it cool. Working with about 6 grape leaves at a time, lay 1 leaf on a clean work surface and stack the other leaves on top, more or less matching up the stems and ends of the leaves. Roll them up from one side to the other. Pack the rolled-up bundles of leaves into the jar (you will likely need to fold one of the ends down to make them fit; you can alternate which end you fold down on each bundle along work into the jar), leaving at least 1/2 inch of headspace at the top of the jar. Bring 1 cup of water to a boil and boil for 1-2 minutes. Add the lemon juice to the jar, then pour boiling water over the grape leaves to cover them completely. Clean the edges of the jar and seal the jar. Process for 15 minutes in a boiling water bath. Let cool and store in a cool, dark place for up to 6 months. Once opened, store in the fridge. Nervous about canning? Keep the results in the fridge even before you open them.